View More In Lighted Holiday Displays - Page 3. 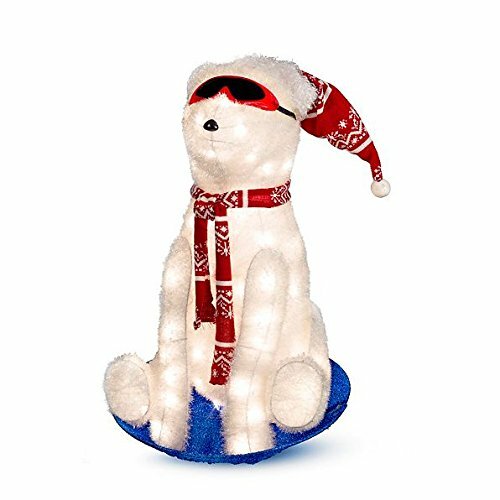 Slide into Christmas with this adorable fuzzy polar bear on a saucer sled, lit with 50 white incandescent lights. The knitted scarf and hat and red goggles add to the adorable effect. Includes 8 ground stakes and 2 ropes for added stability. Stacked plug; UL-listed, 36" cord. Made of Tinsel fabric, metal, plastic, polyester. If you have any questions about this product by Improvements, contact us by completing and submitting the form below. If you are looking for a specif part number, please include it with your message.